The mage on the artwork looks a lot younger and more nubile than the white-haired wizards of the original Izzet. But despite the hip young new look, it's the same old Izzet. Gigadrowse was one of the Izzet's most used, and most powerful, blue spells, but the size of your opponent's army meant it could be quite a mana sink to get it to work right. Blustersquall has no such problem-- four mana and it taps down everything that isn't yours. If history is bound to repeat itself, I have no doubt we'll be seeing Blustersquall clear the way for alpha strikes just as its ancestor did. I like how this card, and the overload mechanic in general, gives you a small vs. bigger dichotomy type of choice, kind of like a twist on evoke for spells. I doubt that's exactly how it was concepted in R&D, though. In practice, a lot of people are going to effectively treat this as an instant for 3U that taps all creatures you don't control, but options are good - and the option for a cheap, early usage turns it from a merely solid card into a potentially game-changing one. Today's card of the day is Blustersquall which is a Blue one mana or four with Overload instant that taps one target or each creature you don't control. This is a decent enough card, particularly in Multiplayer, that isn't overly powerful in a typical Blue build yet could see play in a support role while it is in Standard rotation. The option to cast for one or for four adds noticeable value which should keep this as an option for tap-down themes or more aggressive builds looking for a board changer. For Limited this is a very effective combat trick that can easily win a game when Overload is used. Tapping down the opponent's army on their turn will prevent an attack then allow a likely unopposed alpha strike. Using it when they have mana untapped plus cards in hand may have another creature enter play after the effect, so math is vital to get maximum impact from Blustersquall. A single threat can tapped for just one mana, allowing flexibility in leaving just one land untapped plus only requiring a Blue for either cost allows the typically multicolor decks easy access to the effect. An automatic inclusion when playing one of the Blue guilds and a great second or third choice in Booster. Welcome to a new week of card of the day reviews here at Pojo.com! We are back after a short break, but jump into the action with the hot new cards from Return to Ravnica! Our first look is at Blustersquall. 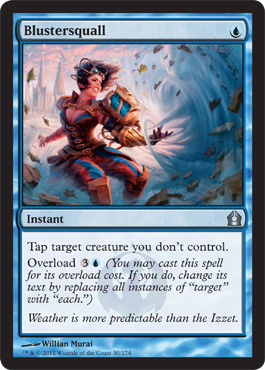 Blustersquall is an uncommon blue instant that costs one blue mana. Blustersquall taps target creature you don’t control. Overload for three generic and a blue to replace the word target with each. Blustersquall features the new Izzet mechanic, Overload, which allows you more bang for your buck, kind of like how the Izzet like it. In this instant, it can be an amazingly useful way to spend your mana. Tapping all of your opponents creatures can have devastating results, and being able to do so for only four mana is indeed a bargain. Hard to believe that this is only an uncommon, but with how vastly powerful this set actually is, it should come as no surprise that powerful cards are in the lower categories of card rarity. Stave off an attack, open the doors for an assault of your own, or however you decide that this is advantageous for you is yours to decide.